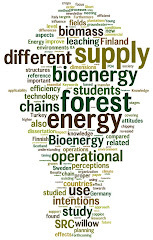 Soon there will be published the estimates of productivity for short rotation plantations for bioenergy in Northern Europe. The basis for the calculations are here. The following map shows the estimates for 2010, for optimal conditions. 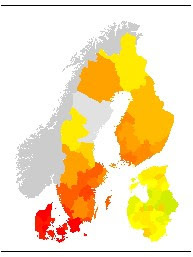 The estimates are based in the results of the Swedish commercial plantations during the last 20 years, including a few thousand plots, and the extrapolated to all the Northern area. The optimal conditions refers that these projections are based using the best plantations (around 25% of all the plantations). Areas in red correspond to about 10 annual dry tonnes per ha. It can be seen that the predictions for the Baltic countries are somehow lower that would be expected based on the climate and soil. This is because the predictions aim to also reflect the potentialities of the agricultural sector of those areas, using the current agricultural production as a proxy. The estimates are made for provincial level, and that is why Finnish Lapland looks all the same, although the potentials for plantations are restricted to agricultural areas, mainly in the south and west. MOLA-YUDEGO, B. 2010. Regional potential yields of short rotation willow plantations on agricultural land in Northern Europe. Silva Fennica 44(1):63–76.